When you install QODBC Online below menu items are created under QODBC Driver for use with QuickBooks Online folder in start menu. Configure QODBC Online Data Source 64-bit option will help you to create/configure QRemote 64-bit DSN which is used in the 64-bit application. Configure QODBC Online Data Source option will help you to create/configure QODBC & QRemote 32-bit DSN which is used in the 32-bit application. Purchase QODBC Online Now option will navigate you to QODBC website for purchasing a QODBC Online license. QODBC Online Quick Start Guide option will open a start guide which will guide you to how to use QODBC Online. QODBC Online Setup Screen option will help you to configure different setup option in QODBC Online. QRemote Server for QODBC Online option will help you to start QRemote Server if it is not running. QuickBooks Online Table Schema option will navigate you to QuickBooks Online table Schema/Data Layout page. README File option will open a readme file which contains information about instructions on how to install the QODBC Online, how to use the basic functions of the QODBC Online, and what the QODBC Online does. It also includes a list of recent updates made to the QODBC Online. Uninstall QODBC Online option will uninstall QODBC Online from System. If you are updating QODBC Online version, then you need to uninstall older QODBC Online version & install newer QODBC version at that time Uninstall QODBC Online option will help you. VB Demo is testing tool is available with QODBC Online which useful in testing connection with QuickBooks Online. VB Demo also useful query table data. VB Demo also can perform insert/update/delete operation using standard SQL language. does the menu option "QRemote Server for QODBC online" imply that SQL server scripts can be used to extract/insert data to online QB? 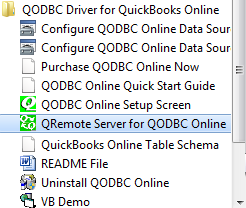 Yes, You can use QRemote Server for QODBC online for extract/insert data to QuickBooks Online using QODBC Online. Please refer below mentioned article for How to create Link Server with MS SQL 2005/2008/2012 Using QODBC Online/QRemote. I. Is it possible to run a server with both the desktop and online server components loaded? II. I currently insert invoices using the process you guys suggested of a. post and invoice line with header information, b. retrieve the last transactionid, and c. post the remaining items using the transactionid. Is that the recommended sequence to use with QBOL? You can use QRemote Server for QODBC Online for working QuickBooks Online & can use QRemote Server for QODBC for working with QuickBooks Desktop. For inserting Invoice through SQL Server, As this is SQL Server disconnect issue. You may be face same issue with QuickBooks Online also. So use the same sequence with QuickBooks Online.